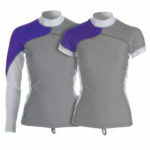 Rash Guard Kid Aqua Lung is glad to announce the first kid’s rashguard with long sleeve. The “Blue Marlin” kids rash guard with long sleeves and UPF 50+ will offer the optimum protection to children. • Perfect sun and jelly fi sh protection for your kids!